Powers/Abilities: Superhuman strength. Able to leap huge distances. Super-breath. Can generate intense heat, able to turn that heat into protective forcefields which can be extended to cover others he is touching. History: (Daring Mystery Comics #1) When local tramps begin to be kidnapped by "zombies", the police ask noted young doctor Jack Castle for his assistance on the case. Trying to investigate, Jack was kidnapped himself, and taken to the "Zombie Master", who proved to be a 20' tall scientist employing a hypnotic ray to make an army of zombie homeless people to commit robberies for him. Having done his duty as a criminal mastermind by explaining his plans to his captive enemy, the Zombie Master then tried to hypnotise Jack. Jack's own knowledge of hypnosis allowed him to resist, so the Zombie Master turned up the power. The equipment overloaded and exploded, killing the Zombie Master but irradiating Jack, giving him superhuman powers. 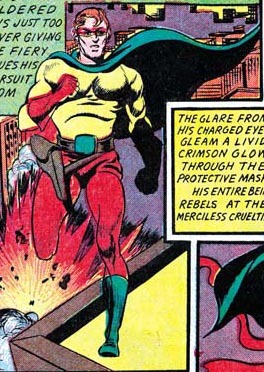 Jack decided to use these powers as a superhero, and designed the costumed identity of the Fiery Mask. (Human Torch Comics #2) The Fiery Mask battled the Doctor, another scientist who liked turning people into his zombie slaves, but who also had a sideline in giant buzzards. (Daring Mystery Comics #5) The Fiery Mask battled Dork, another scientist, though this one rejected zombies and buzzards, and instead employed a giant ape. (Daring Mystery Comics #6) The Fiery Mask travelled to Hell, where he fought the demonic Legion of Doom. 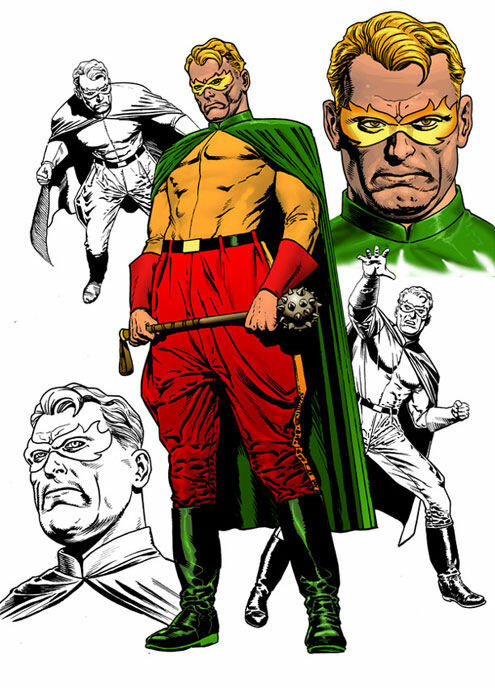 (The Twelve #1-12) Fiery Mask took part in the Allied invasion of occupied Europe, but alongside other heroes was captured by the Germans and placed in suspended animation. He has recently been revived. Comments: Fiery Mask is due to be revived soon as part of the new Marvel mini-series "The Twelve" by J. Michael Straczynski.